Pitt’s 2018 NFL Draft selections — offensive lineman Brian O’Neill, safety Jordan Whitehead and cornerback Avonte Maddox — all share common skills that made them appealing to professional teams — positional diversity and exceptional speed. Had these athletes played for different college teams, they may not have been able to showcase the abilities that made them stand out. O’Neill might have played tight end— the position he was originally recruited for — instead of lineman, and Whitehead might have only been able to showcase his talents on one side of the ball. But at Pitt, the coaching staff didn’t shy away from thinking outside the box in order to utilize each player’s full potential. O’Neill, who ran the fastest 40-yard dash time of all offensive linemen at the 2018 NFL Combine, was first Panther off the draft board when the Minnesota Vikings took him in the second round with the 62nd overall pick. After a quiet third round, Pitt’s remaining players were selected close together in the fourth, with the Tampa Bay Buccaneers selecting Whitehead at 117th and the Philadelphia Eagles taking Maddox 125th overall. O’Neill didn’t have the type of career trajectory expected for offensive linemen. He played tight end — not offensive tackle — during his time at Salesianum School in Delaware, racking up 33 catches for 614 yards and eight touchdowns, while leading his team to a state championship title as a senior. While he played a large role on his high school team’s success, he was ironically mediocre at the one task which he will now perform for a living — blocking. O’Neill also enjoyed a prolific high school basketball career, leading the Sals to their first state basketball championship in school history as a senior in 2014. The 6-foot-6 player averaged 13.5 points and 8.2 rebounds and was named the Delaware Boys Basketball Player of the Year while playing alongside Donte DiVincenzo, who would go on to become this year’s NCAA Final Four Most Outstanding Player at Villanova. After being recruited by Pitt as an athletic tight end, O’Neill made the tough decision to switch positions to offensive tackle in 2015 due to injuries on the offensive line. The rest, as they say, is history — O’Neill started in 37 of Pitt’s next 38 games, playing right tackle during the 2015 and 2016 seasons before switching to the left side in 2017. His blocking abilities earned him All-ACC honors in 2016 and 2017. But the Panthers’ coaching staff didn’t forget about O’Neill’s pass-catching abilities, as the team created trick plays to utilize his deceptive talent. O’Neill rushed for two touchdowns in 2016, earning him SBNation’s Piesman Trophy — an award given annually to a college lineman who does unlineman-like things. O’Neill’s fellow NFL draftee Whitehead also shined on both sides of the ball at Pitt, where he played the rare role of a two-way threat. Whitehead flashed his versatility at Central Valley high school, where he accumulated 35 touchdowns in his senior year via rushing, receiving, interception return, kickoff return and punt return. Rated the No. 1 prospect in Pennsylvania by Rivals.com, Whitehead chose to stay in his hometown and play for Pitt — following the footsteps of seven-time NFL Pro Bowl cornerback and former Panther Darrelle Revis, who happens to be Whitehead’s cousin. As a true freshman in 2015, Whitehead took no time to impress. Playing safety on defense, Whitehead led the the Panthers with 109 tackles — the most by a true freshman in school history — and was named the ACC’s Rookie of the Year. Whitehead also established himself as a legitimate two-way player, tallying 12 rushes for 122 yards and two touchdowns on offense. Despite being undersized at 5-foot-10, 198 pounds, Whitehead appealed to NFL teams because of his fierce athleticism and ability to play multiple positions. Just eight spots after Whitehead was taken, the Eagles selected his fellow defensive backfield teammate Maddox with the 125th overall pick. Like Whitehead, Maddox established himself as a diverse playmaker in high school. In his senior year at Martin Luther King High in Detroit, Maddox racked up 956 receiving yards and 14 touchdowns, 717 rushing yards and four touchdowns and four interceptions — two of which he returned for touchdowns. 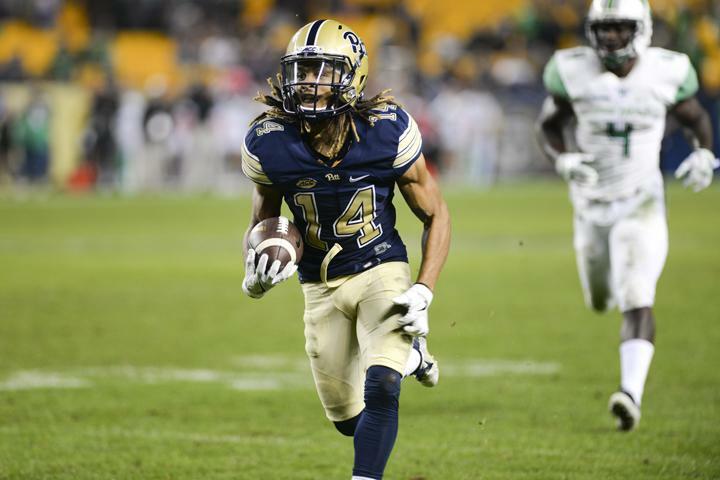 Maddox’s penchant for pick-sixes continued in his time at Pitt, where he returned an interception for a touchdown in both his sophomore and junior seasons. He became the rock of the Panthers’ secondary, leading the team in both pass breakups and interceptions during his sophomore, junior and senior seasons. In addition to his consistent presence on the field, Maddox also became known as a leader and high-character individual within the program. He served as a team captain during his senior year and was awarded the University’s Panther Award, presented annually to the senior student-athlete who has best promoted Pitt Athletics through outstanding athletic achievement. Like O’Neill, Maddox further helped his draft stock at the NFL Combine by running one of the top 40-yard dash times for his position. His mark of 4.39 seconds ranked seventh-fastest among defensive backs, and flashed the sort of speed that made him a big-play threat at Pitt. It remains to be seen how much playing time these three Panthers will earn in their rookie seasons, but with each one’s high-caliber quickness and ability to play multiple positions, it should only be a matter of time before they earn the opportunity to succeed in the NFL.